Please join us at The Kings Arms for carols on Thursday 20 December at 7pm. Audience participation is optional. Singing is free but drinks and food are not! We are pleased to have again been invited to sing at Bicton Park on Friday 14 December at 4pm. Entry is free. For those of you who like joining in, Members of the choir will be singing carols on Thursday December 13th at The Balfour Arms, Sidmouth. Entry is free! We shall be signing a short program after a slide show in East Budleigh Village Hall. Then some Community singing WW1 favourites. This is FREE. We had a great afternoon of singing along with friends and visitors in a packed Village Hall. Enjoyed by everyone. 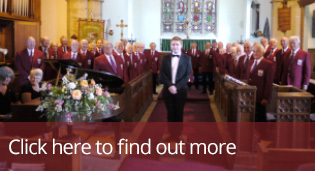 Come to All Saints Church, Sidmouth and enjoy our singing plus a glass of wine/soft drink for only £10.00. We are performing for the benefit of Sid Valley Memory Cafe. Tickets will be on sale at Paragon Books, Sidmouth. 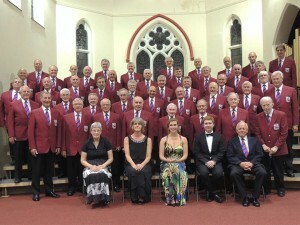 Following our highly successful joint trip to France, we are going to perform at Barnstaple MVC's home town. Discussions are taking place over performing some of the joint numbers that we performed in the Auvergne.